Mango Sago is a very popular dessert served in Asia. 1. Blend half of the mangoes with 1 to 2 cups of water and fine sugar until smooth and keep it in the freezer until it becomes semi-hard. 2. Cut the remaining half of the mangoes into small cubes about 2cm thick. Set aside. 3. Cook the sago pearls with 2 cups of water until it becomes clear. 4. Put the mango puree into the blender to blend it into a sandy texture. 5. 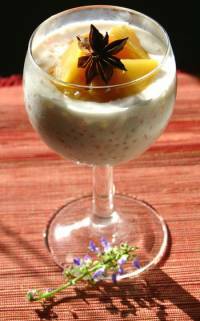 Pour the mango puree into a bowl, add in the cooked sago pearls and sugar syrup. 6. To serve, top with the fresh mango cubes and coconut/condensed milk. Quite a delicious flavour and a dash of fun element too!